The herd is intensively monitored with locations of calving grounds identified every year since the early 1970's, early calf survival every year since 1983, and comparable population estimates since 1976. The Porcupine Herd reached a peak in 1989 (178,000) and, then declined until the 2001 census (123,000) at a rate of 3.5% per year based on censuses in 1992, 1994, 1998 and 2001. Early movement of the herd from the Alaskan coastal plain and bad weather during late June and early July has prevented a population estimate after 2001. A successful population estimate was finally completed in 2010 indicating that the herd had increased to 169,000 animals. In 2013 estimate indicated that the continued to increase to 197,000, representing an average annual growth rate of 5% from 2010 through 2013. Of all herds in North America which increased in the latter quarter of the 20th Century, the Porcupine Herd had the lowest rate of increase, however with increasing numbers since 2001 the herd presently is the only major North American herd that is on the increase. 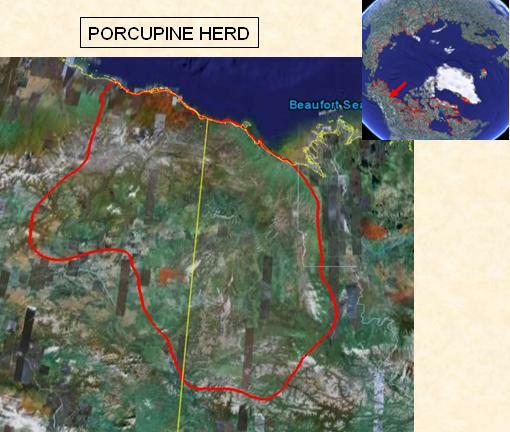 The Porcupine herd winters in the Ogilvie and Richardson Mountains and Eagle plains region of central Yukon and in the southern Books range of northcentral Alaska (Russell et al 1993). The progress of spring migration is related to the timing of snowmelt and cows can be delayed even up to the calving period (e.g. 2000 and 2001; Griffith et al 2002). In those years of late snowmelt a large number of calves did not survive the first month of life. Calving usually peaks in early June. Calving grounds are located on in the foothills and coastal plain of Alaska and northwest Yukon (Griffith et al 2002) with animals tracking early green vegetation to support the high costs of lactation. In summer the herd spreads out further onto the coastal plan and east through Ivvavik national Park in Yukon to the Richardson Mountains. Fall migration is usually spurred on by snow storms. The herd is intensively monitored with locations of calving grounds identified every year since the early 1970's, early calf survival every year since 1983, and comparable population estimates since 1976. (ADF&G 2015). Individuals have been tracked via radio-collars on the herd since 1978. The Porcupine Herd usually calves on the Arctic coastal plains but summers more inland in the Foothills and winters in mountainous basins. This elevation variability contributes to a climate which differs from the neighboring herds in cooler and moister summers with a low drought index. Snow depths are greater. Current trends (since 2000) indicate a higher late spring and summer growing degree days. As well since 1979 summer precipitation, has increased, summer drought decreased and fall temperatures increased. As the herd migrates across Northwest territories, Yukon and Alaskan jurisdictions in Canada and the United States, the management of the herd fall under a number of state, federal, territorial and national management agencies. In 1987 the United States and Canada established the International Porcupine Caribou Board (IPCB) to coordinate management and research among government and user groups. IPCB includes a representative from the Alaska Department of Fish and Game (ADF&G), representatives of the governments of the United States, Canada, Yukon and Northwest Territories, and members of communities and Native organizations in Alaska and Canada. Within Canada, the Porcupine Caribou Management Board (PCMB) was established in 1985. The PCMB is an advisory board established under the Porcupine Caribou Management Agreement (1985) to communicate information about the herd and provide recommendations to Canadian agencies responsible for managing the herd. The Porcupine Caribou Management Board, along with the Parties responsible for the management of the herd, worked together to create the Harvest Management Plan for the Porcupine Caribou herd in Canada and its accompanying implementation strategy. The Plan coordinates management actions for the herd's conservation and lays out how the Parties will respond according to the status of the herd. Griffith, B., D. C. Douglas, N. E. Walsh, D. D. Young, T. R. McCabe, D. E. Russell, R. G. White, R. D. Cameron, and K. R. Whitten. 2002. The Porcupine caribou herd. Pages 8-37 in D. C. Douglas, P. E. Reynolds, and E. B. Rhode, editors. Arctic Refuge coastal plain terrestrial wildlife research summaries. U. S. Geological Survey, Biological Resources Division, Biological Science Report USGS/BRD BSR-2002-0001. Russell, D. E., A. M. Martell, and W.A.C. Nixon. 1993. The range ecology of the Porcupine Caribou Herd in Canada. Rangifer Special Issue No. 8, 168 pp.